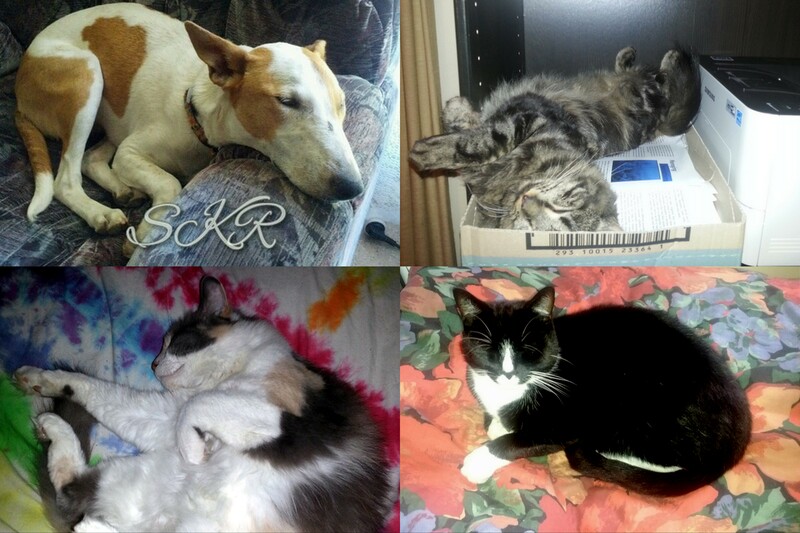 I live in South Australia with my beloved fiancée called Rose on my blog, and our critters; Zoe, and the three cats are (clockwise from top right) Tonks, Sarsaparilla, and Bebe. It’s been a hard road, including the miscarriage of our dearly loved Tamlorn. Rose and I decided to share our pregnancies from pre-conception care through and document the journey publicly. We now love two beautiful girls, our little one Poppy, and our eldest Star we informally adopted. I have experienced disability and previously needed a wheelchair due to several chronic physical illnesses, such as endometriosis & adenomyosis, and fibromyalgia. Currently my health is well managed. I identify as bisexual, genderqueer, and multiple. (my pronouns are they/them or she/her) I have had Post traumatic Stress Disorder and can still have a tough time with anxiety. I’ve been sharing the good times and struggles through my blog since 2011. Being visible is at times very challenging, but it’s an important part of finding our common humanity and helping the world to be more accepting of diversity. Articulating personal experience, and safely exploring sensitive topics is a passion. Creativity is part of how I connect to my world and nurture my soul. I love things that help us to be more human. Loneliness is soul destroying. I’m passionate about community and belonging. A lot of it has been very hard. It’s also been amazing. I’ve experienced a tremendous amount of both the beauty and the horror. I’ve come through homelessness, domestic violence, severe illness, I’ve cared full time for suicidal loved ones, struggled with self harm and self hate, and been so severely dissociative it felt like I was dead. This is where I’ve developed many of my skills; walking past a cafe when I was 15 and seeing a stranger in distress, and sitting with her to talk her out of her suicide plan. Caring for a couple as one of them dies through terminal cancer. Binding a friend’s self harm wounds. Not all learning comes through suffering; I’ve also watched a meteor shower from my roof, birthed my daughter into water, received a standing ovation at a major conference, seen the moon rise over a great salt lake in the desert, learned to ride a motorbike at 7, received emails from strangers saying my writing has saved their life, sold thousands of dollars of artwork at exhibition, and laughed so hard with friends that I fell off my chair! I don’t allow the reduction of my story down to something inanely simple – tragedy, triumph, or recovery. I delight in the complexity and contradictions of my own and others’ experiences. I’m currently working on a Graduate Certificate in Public Health, a Diploma in Visual Arts, and I have a Cert 4 in Mental Health Peer Work and 10 years experience in the health and community sectors.